Looking for a bus in Glencoe? Chicago Charter Bus Company has access to hundreds of buses to take you to the Chicago Botanic Garden or into the city for a day of exploring. Life on the North Shore is a breeze… Literally. Glencoe provides a lot to its residents—the golf club, beach, and the grand prix are all attractions that would make any lost tourist happy they stumbled upon little ‘ol Glencoe instead of Chicago. Sometimes, though, you’ve got to get out of Glencoe. For those moments you’ve got a group who needs to be somewhere, Chicago Charter Bus Company has the carpool solution you’ve been searching for. No more chains of cars following each other on the highway when you’re en route to the Cubs game. Instead, skip the road rage and enjoy going out to the ball game with your friends and family together. With a convenient 18-passenger minibus, everyone can fit in one car, and nobody has to drive. This scenario is just one of many we help out with when renting out coaches to Glencoe passengers. We proudly serve many types of customers, helping planners of all kinds cross to-dos off their lists. We’ve rented buses or shuttles to wedding planners, event planners, administrative assistants, and even school officials, and it’s no coincidence that these clients continually choose us again and again. Our commitment to safety, efficiency, and comfort pegs us above the rest. Not to mention how easy our booking process is—you can get a quote within minutes of calling us. Call now at 312-667-0906​ if you’re ready to book your coach today. Is your football team heading to the big championship? The 56-passenger coach is an excellent choice that can fit the whole team comfortably, plus support staff and gear. Smaller groups such as bachelorette parties and elementary school classes might benefit better from the 25-passenger minibuses. The smallest shuttle available seats up to 18, making it a fantastic airport and wedding shuttle for short trips. Every size coach can be customized to fit your occasion—just be sure to ask your booking specialist about all the options available to you. Popular amenities include free WiFi and reclining seats, which may be available at no additional cost to you. No matter where you're headed, whether it's in Arlington Heights, Elgin, Oak Park, Winnetka, or another Chicago neighborhood, we've got your group's travel covered. Get your affordable coach or shuttle quote today by calling 312-667-0906​. 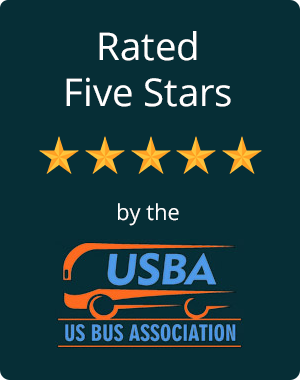 Our attentive booking team is available all day, every day to speak with you about your charter bus options and to provide you with a free quote. Don’t wait too long to find your dream bus!